Because most lizards have evolved to operate at relatively high body temperatures, most prefer a terrestrial existence. However, a few species have adaptations that allow them to expand their habitat beyond the shores of ponds, rivers and swamps. Some species are so dependent on ponds and other water sources that they would struggle to live far from them. Caiman lizards (Dracaena guianensis) are large green lizards with red or brown heads. Native to South America, caiman lizards reach up to 4 feet in length and approach 10 pounds in weight. They spend most of their day alternating between foraging in the water and basking on branches over the water to raise their body temperature and dry off. Caiman lizards specialize in consuming large aquatic snails and have broad, flat molars that they use to crush the shells. These amphibious lizards of Southeast Asia are named crocodile lizards (Shinisaurus crocodilurus) because of their tail, which has two rows of scales, much like a crocodile’s tail. Crocodile lizards live in and around the slow pools, ponds and rivers of forested areas. The lizards are carnivorous and consume tadpoles, insects and worms. Much of their time is spent basking or lounging on branches overhanging the water; if danger approaches, they quickly dive into the safety of the pond. Though these lizards are predominately brown or grey dorsally, the males develop bright orange ventral and lateral coloration during the breeding season. Basilisks and sail-fin lizards live on different sides of the planet, but exhibit somewhat similar lifestyles. The basilisks (Basiliscus sp.) of Central and South America spend much of their time prowling on dry land for food near a large body of water. Though they do not specifically require the water to obtain their food, many of the insects and small vertebrates they eat are drawn to the water. Basilisks use the water in a more important way, though -- as an escape from danger. When approached by a predator, the basilisk will either dive to the bottom of the water and hide, or literally run across the surface of the water. The behavior -- which has earned the basilisk the nickname “Jesus Christ lizard” -- is possible thanks to their specialized running style, speed and enlarged toe scales, which increase the surface area of their feet. Aided by their dorsal fin and powerful tail, basilisks are incredible swimmers, capable of holding their breath for at least 30 minutes at a time. Sail-fin lizards are endemic to the Philippines, and grow slightly larger than basilisks. Sail-fins have an even more highly developed dorsal crest than basilisks do, and though they will consume insects and carrion, are primarily herbivorous. 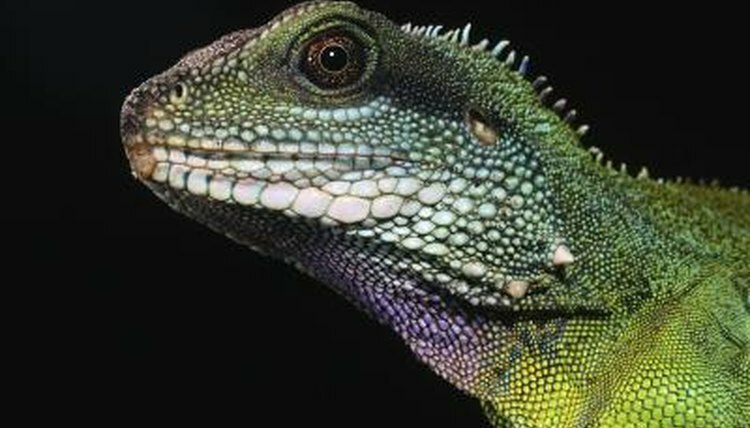 Water dragons range from Southeast Asia all the way to Australia. Two distinct forms exist: an Australian and an Indochinese form. While they were initially classified as members of the genus Physignathus, the Australian water dragons were recently moved to their own genus and designated as Intellagama lesueurii, while the Chinese water dragon remained Physignathus cocincinus. Despite their morphological differences, the two have similar lifestyles; both inhabit trees and shores around water, fleeing to the safety of the water at the first sign of danger. Both have tall, flat tails that aid swimming, though Chinese water dragons have a large crest as well. Why Does a Flamingo Eat With Its Head Upside Down?